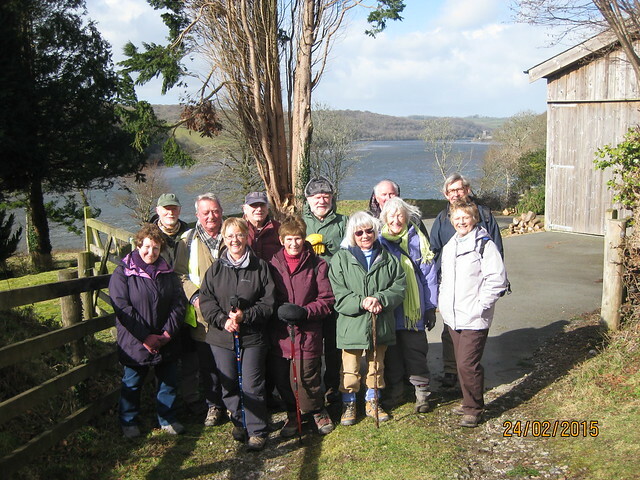 meet up with two others, who traveled independently, at Cotehele Quay car park for the start of our 5.9 mile circular walk. Rain just started to fall as we set off from the cars to walk uphill to Cotehele House and a comfort break. Cotehele House belonged to the Edgcumbe family for nearly 600 years before being donated to the National Trust in 1947, together with over 1000 acres of land, and it was part of this land that we walked as we started below the house towards Calstock. With the enthusiasm of youth we went headlong down the path without taking notice of my walk notes and missing a turn to the left which would have taken us above the valley but instead we carried on down into the valley and towards Calstock. After about 1 mile we realised that we had gone wrong but continued looking for a bench, listed in my notes, but when we realised that the next landmark was a level crossing and we were then walking under the massive 120 foot viaduct taking the Plymouth to Gunnislake railway; there was no doubt that we were wrong!­ We did tell everyone at the start that we had not done all the walk before, ­a lesson to be learnt for all walks leaders. So we carried on into Calstock to see if we could get back onto the required route and headed uphill about 120 feet to the parish church of St Andrew a 15th century building and back on schedule. The church was consecrated in 1290 and is under the Patronage of the Duke of Cornwall. Through the churchyard gate and left along a lane takes us past a level crossing. ( See Picture ) The railway opened in 1872 to bring minerals from more mines in the area to the Calstock incline leading to the quay. In the early 20th century the new railway in Plymouth allowed the Calstock railway to be connected and much of the trackbed of the East Cornwall Mineral Railway was re-used for the Tamar Valley Line. also contained silver) were also extracted. In 1865 it was recorded that the mine had two engines and employed 107 people; 80 men, 15 boys and 12 bal maidens. 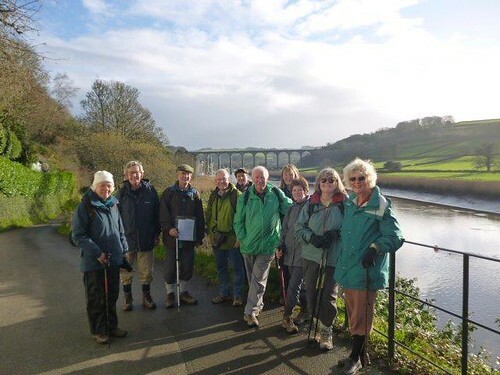 Following the path further down we walk alongside the River Tamar with views of Calstock to our right. The name Tamar is documented in the second century and it is thought that its name might share a common origin with the River Thames and might stem from an ancient Celtic word meaning”dark”. It flows some 61 miles south across the peninsular forming the majority of the historic border with Devon. At the end of the path and crossing a sports field the sun comes out with pure blue th century building and back on schedule. The church was sky and eight picnic benches appear at exactly the right time for our picnic lunch. Who need planning or when will our luck run out! ginger scones and blackcurrant and gooseberry jam. although it did rain heavily on the way back in the car. 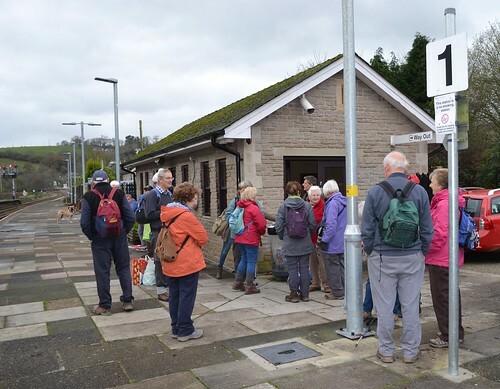 Eighteen walkers met at Lostwithiel Station on a damp morning with the prospect of some rain later in the day to catch the 10.45am Cross Country service to Bodmin Parkway Station. This station was finally ready to open on 27 th June 1859 and was named “Bodmin Road” because of its remote location. A goods shed was built in 1860 at the east end of the station, behind the platform for trains to Plymouth and cattle pens were added the following year. A footbridge across the line was built by Mr. Robartes, a known supporter of railways, in 1860 to enable visitors to reach the Lanhydrock estate more easily. This was later replaced by a passage beneath the tracks and and was this path that we followed towards Respryn Bridge following the path of the River Fowey which was flowing very full after all the recent rain. As reported in a previous walk this bridge played an important part in the Civil War, lying as it did between the two major estates of Lanhydrock and Boconnoc, one in parliamentary hands and the other royalist. King Charles rode over the bridge in 1644 on his way from Boconnoc to Lanhydrock and after the war the avenue of trees leading up to Lanhydrock House from Respryn was planted by Lord Robartes tocelebrate his party's victory. parts of Bodmin, Redruth and Camborne. The works produces around 62 megalitres of water a day during winter and 72 in summer. Heading towards the 500 year old Restormel Manor we pass the holiday cottages and the Lostwithiel bowling green and thoughts of maybe a cup of tea or scone at the Community Centre before we head home. Eleven walkers set off from the Community Centre to drive to our parking spot at Trevigue just south of Crackington Haven. Two drivers missed the turning in the low lying mist on the A39 but all arrived safely in the end. 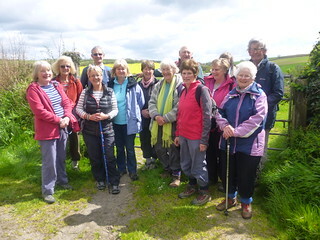 Despite the poor weather forecast we were all optimistic of a good walk as we set off down hill towards the valley floor. 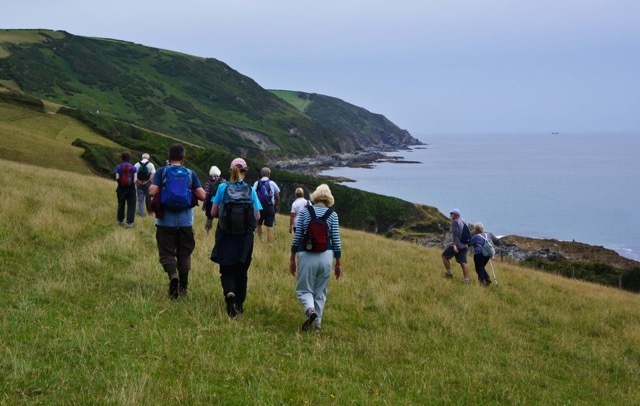 This is a classic Cornish walk with the outgoing part via an attractive stream side path through a wooded valley and the return along towering coastal cliffs. The path was very muddy in places as we all looked for the driest path and being very careful not to fall into the quagmire. Still following the steam and through east wood we were soon in Crackington Haven and our first stop for an early lunch and hot drinks from the cafe. The weather was still fine and in fact a bit brighter so we all decided to sit outside and enjoy the fresh air. After a good stop and making sure that our ladies had not locked themselves into the only disabled toilet we started up the path just above the Surf Life Saving Club and past the two tennis courts leading onto the coast path. The path climbs to Bray's Point from where there are views across Tremoutha Haven to the headland of Cambeak. Skirting around the headland we pass through a narrow col to reach the coast path again and the full force of the wind as it tried to blow us inland; better than blowing us off the cliffs!. The contorted rock strata on Cambeak could be seen clearly to our right as we continued up the coast path gaining height steadily only to engulfed in the sharp spines of gorse with seemingly no way to go! We had gone wrong and taken a sheep track instead of the coastal path so we had to retrace our steps down hill before joining the coast path again and with Strangles Beach below and the rocky cliffs of High Cliff visible, at 731 feet above sea level Cornwall's highest, we missed the turning to Trevigue, at this point I did offer my resignation as joint leader, and proceeded on an extra half a mile to turn left onto the road and a short distance back to the cars. The light was failing by now but we had only had a very slight shower and the temperature was still about 15 degrees so we were again very lucky with the weather-if only the map reading had been as good! We will be meeting at 10.00am for 10.15am start to Trevigue. Picnic lunch can be taken. Blessed again with glorious weather 15 walkers set off a little earlier than normal in view of the one hour drive to the coast just south of Bude. Parking in the large car park overlooking Widemouth Bay we all proceeded north to our first pre-planned stop after 30 minutes of easy coast walking. The stop was at Elements an excellent restaurant just off the coast path where we could all sit outside in the sun and enjoy our coffee or chocolate or tea with the occasional scone or piece of cake. Time to set off again and do some walking so we rejoined the coast path to go behind the cottages at Upton and headed for Efford Beacon. The path at this point is on broad grassy stretch with far reaching views and the site of the beacon includes a trig point and what looks like a dog kennel. A little further along we visit the Compass Point a site of an unusual octagonal storm tower which has the compass point markings that have given the viewpoint its name. Turning eastwards now and down into Bude and the mouth of the canal and what now is a quiet leisure facility with walkers on the tow path and some rowers and canoeists. In the last century however this tranquil scene would have been filled with canal boats transporting sand and lime to the inland agricultural areas to redress acid soils. Plans at one time were to link with the River Tamar at Launceston so creating passage between the Bristol and English Channels; but they came to nothing with much of the canal being abandoned in the 1880's. 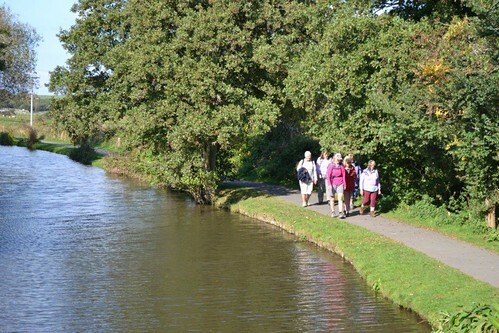 The only two locks on this stretch before Helebridge Basin have been recently restored and are in excellent condition. From Helebridge they used inclined planes to move the tub boats to the summit of the section at 433 feet above sea level. We all stopped for lunch and comfort break near the canal side in Bude after yet more photographs and decided at 1.45 it was time to walk along the tow path and the peace and tranquility of the canal, crossing onto the other side of the canal at Rodd's Bridge, until we reached Helebridge and then the walk uphill across arable fields now sprouting with spring cereal . The summit now yielded those wonderful views of Widemouth Bay in front of us and the white washed cottage at Marhamchurch behind us. Downhill across the road and onto the coast path near The Salthouse, which was an 18th century salt store that is now converted into a holiday home, for the short stretch back to the car park. 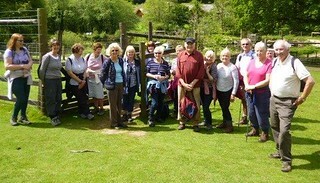 We all made it back better for the exercise and the companionship of the fellow walkers. 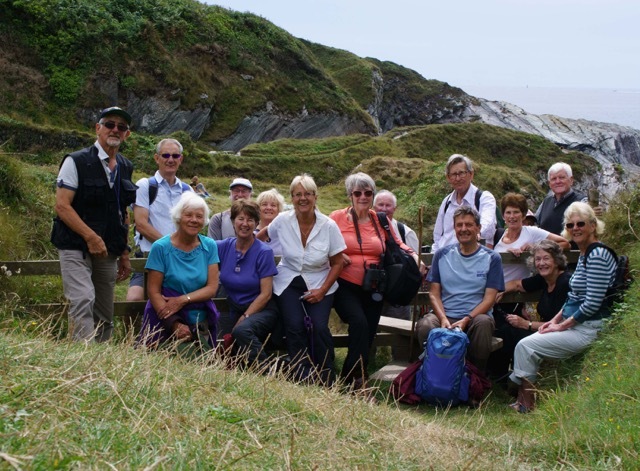 On another glorious late Summer day eight walkers set off from Hannafore at the west end of Looe for our walk. We had all decided to go for option 2 and walk the what was to turn out to be the 4.5 miles of this so called “moderate grade walk”. With a slight wind blowing off the sea but sun shining on Looe Island we walked towards the start of the walk proper in the large car park to the left of the A387 as you head towards the bridge. Before we got to that point we all decided to have a drink, one of us even had half a scone, at the cafe beside the harbour wall. After that pleasant break we set off through the car park and the long assent up through Kilminorth woods and through two large arable fields, still climbing upwards yielding magnificent views across Looe Bay. After passing through a few more fields and farm gate we bear right and reach a metalled lane with Kilminorth Farm to our right and the holiday complex called Kilminorth Cottages to our left. The surroundings of these cottages looks well kept and the cottages, under the Hoseasons brand, also has heated swimming pool and tennis courts available to the occupiers. Downhill now towards the West Looe River and Watergate and the lovely looking cottages on either side of the minor road. 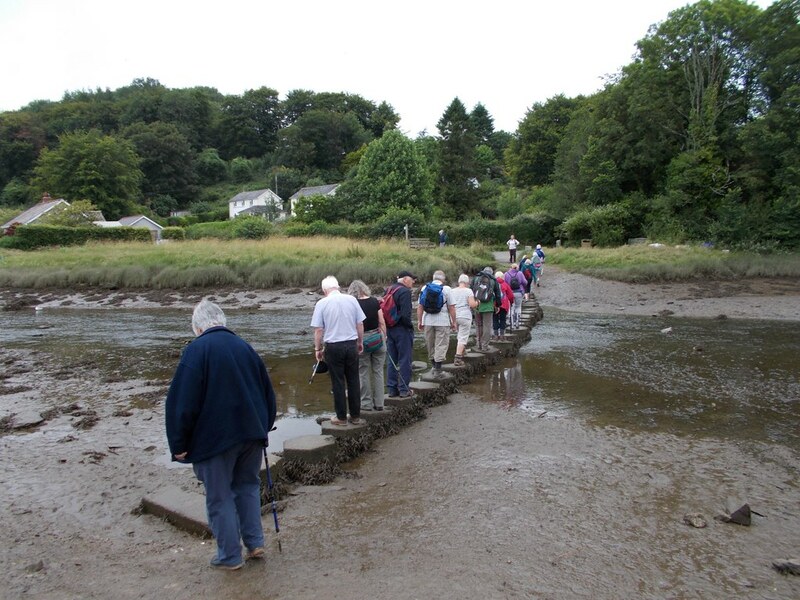 We now turn right and with the tide out are able to take the lower of the two trails and walk along the estuary towards Looe. The oak woods on this side- Kilminorth Woods and the north side- Trenant Woods forms one of the largest oak woods in Cornwall. 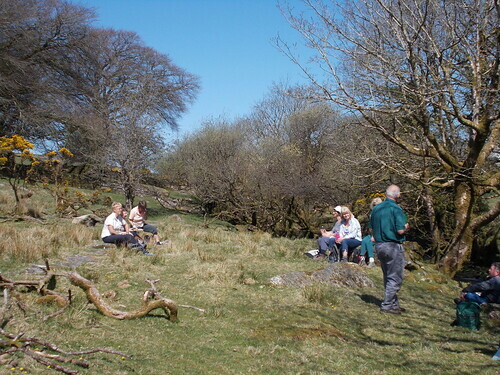 We soon come out of the woods and onto the foreshore itself and an ideal place for our picnic lunch with the sun shining down and just the sound of the sea birds. After another pleasant stop we head back out of the woods and into the car park again and retrace our steps back to Marine Drive and the realisation that the lovely cafe by the Tennis Courts is open. The apple pie, the cream tea and the toasted tea cake all come with a recommendation;who could resist sitting in the sun again and making sure we did not suffer from lack of food or drink. We finally made it home at about 3.30pm after 4.5 miles walking a lot of talking and eating and drinking. Our next walk will be Tuesday 13th October-more details to follow. 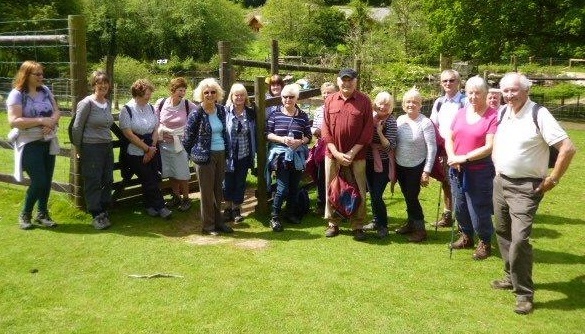 On another sunny day eleven walkers set off, after a slightly earlier start from Lostwithiel,over the wooden bridge and through the memorial gardens and past the pond on the footpath to Portloe via Trewortha. Uphill at the start and on farmland with cattle keeping out of the sun in the top corner we all set off at a decent pace heading for a small metal gate in the top corner of the field and through a small copse. From this elevated position the round houses at Veryan can be seen, as can the china clay workings towards St Austell. Past farm buildings and the converted Trewortha Chapel we head towards Portloe and, avoiding the Western Power workers cutting tree branches away from overhead power cables, we reach the attractive and quiet fishing village of Portloe. As it was just past 11.30 it was decided that a drink on the balcony of The Lugger Hotel overlooking the harbour would be in order. After an excellent coffee and toilet stop we started again and joined the coast path heading South onto Jacka Point and towards Menare Point. The path continues through gorse and blackthorn and blackberry bushes with the imposing Gull Rock clearly in view offshore. Time for our lunch stop before we head inland with the sound of the waves beneath and the sun shining above;what could be better? After our food and for one a quick nap, must have been the size of his pasty, we headed off the coast path and around the imposing Broom Parc. This is now under the ownership of the National Trust and is open as a Bed and Breakfast and was used in the filming of Camomile Lawn based on the novel by Mary Wesley. After passing through the hamlet of Camels we turn right and onto a footpath which passes through mature woodland before rejoining the outward route used earlier and the memorial gardens. The drive back took us again through the historic village of Veryan and the much photographed Round Houses, one of which was for sale-yours for £645,000. On yet another fine Tuesday sixteen walkers including another two new members set off from what is now called “Lantic Bay” National Trust car park to walk the 4.2 mile circular route along the coast path and returning inland. 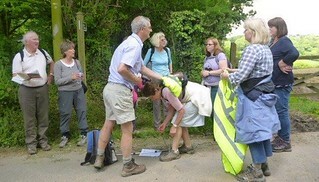 Jean had signed up for this walk and she was in our thoughts as we set off. This is one of my favourite walks as it takes in the wonderful coastal views, wooded valleys and farmland -although we have to do without a coffee/tea shop. 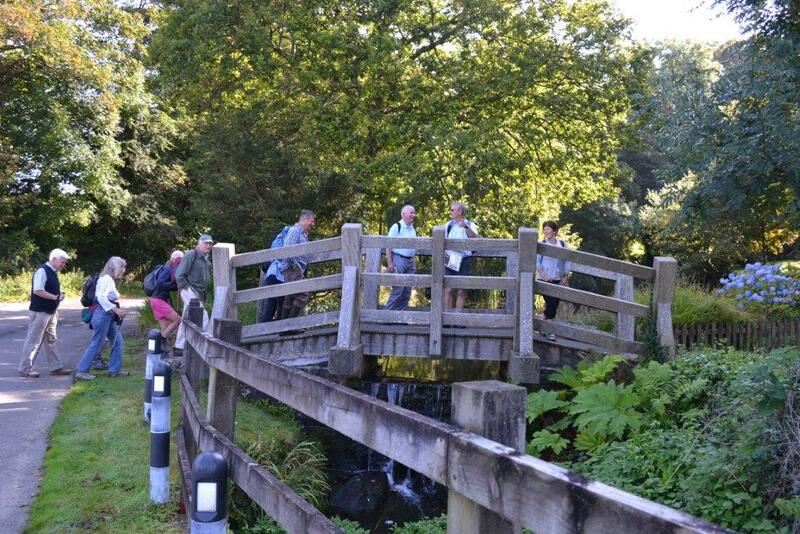 The pictures taken by our walks photographer Paul show the variety of views as we proceeded along the route. Heading out of the car park we travel south to pick up the South West Coast Path towards Pencarrow Head with the magnificent views of Lantic Bay to the west and Lantivet Bay to the east. 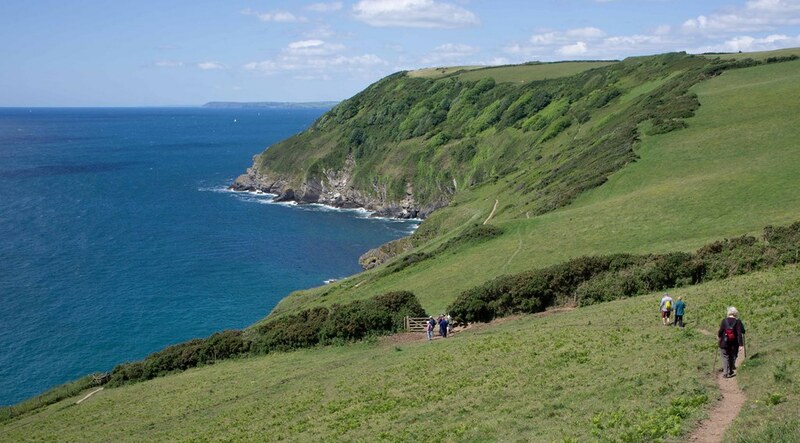 Much of this coastline in this area is under the protection of the National Trust including Pencarrow Head which was given anonymously in 1959 by a lover of Cornwall. The coast path has its normal ups and downs as we proceed eastwards and past Watch House Cove and Palace Cove around Sandheap Point and our lunch time stop at Lansallos Beach- an isolated quiet small shingle cove which made an ideal stopping point and for two of the walkers an ideal spot for a swim as the tide was rising and the clear water shelved steeply. Two of our other walkers nearly had an unplanned paddle as the tide arose around them as they had their lunch. 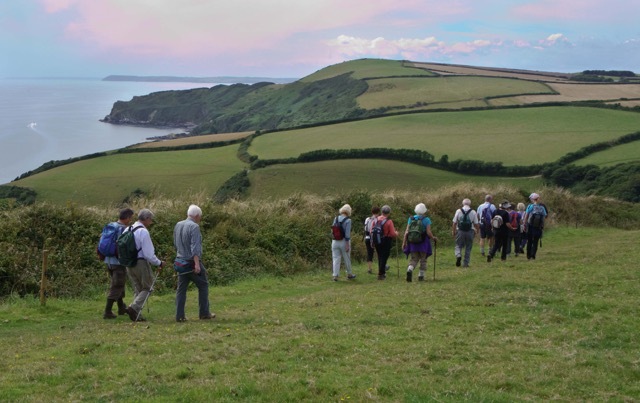 After a pleasant stop we headed north through a wooded valley with a stream running down towards the sea and West Coombe towards the church at Lansallos. The village was recognised as a religious centre after the Celtic missionary monks evangelised Cornwall in the early centuries of the first Christian Millenium. Dedicated to St Ildiema this small church holds many important architectural and historic features including magnificant carved oak benches which were made between 1490 and 1520. Unfortunately some of its most important features were destroyed during a fire in 2005. It is believed that the fire was an act of arson and despite the efforts of the fire brigade the fire spread quickly and destroyed many features but thanks to donations most of the church has been restored and acts again as the heart of the local community. Past the church we then turn west again on a footpath, between the graveyard and the busy and excellent real camp site run by the NT, onto farm land and through another wooded valley and across a small stream, past a granite scratching post and some more stone steps before descending onto a metalled lane. About a further one third of a mile ahead we reach the NT car park at Frogmore with its toilets and then along the road past the NT properties at Triggabrowne to our cars. 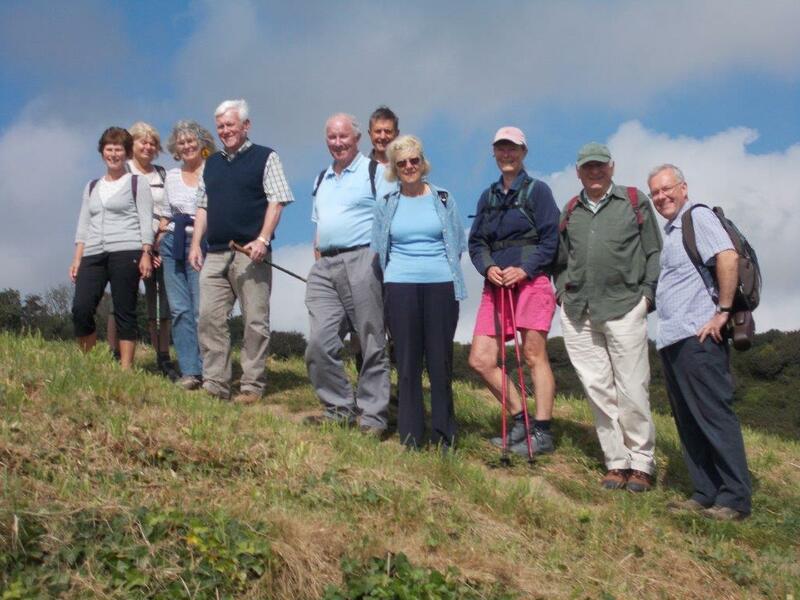 We hope to see another good turn out for our start to the Autumn season and two walks per month on the 8th September. WILL YOU LET US KNOW BY SATURDAY 8TH AUGUST LATEST PLEASE IF YOU WOULD LIKE TO COME ON WALK AND IF YOU CAN OFFER LIFT. For this 5 mile circular walk a record number of 24 walkers set off from the Lerryn car park and with the tide out all skipped over the stepping stones -see photo- so that we could turn left onto the creekside path and towards the National Trusts Ethy Woods. The path continues above Lerryn Creek on gravel track and woodland path past a small inlet called Mendy Pill and towards St Winnow point before heading north west towards St Winnow itself. After a few stiles and across a field we arrive at the foreshore and the church of St Winnow. The parish of St Winnow covers fairly large area from the River Fowey to the main London to Penzance railway line at Lostwithiel. The church is a 12th Century building substantially rebuilt in the fifteenth century which may stand on the site of a Celtic monastry. The north wall is the only remaining part of the original twelfth century building. Of particular interest are the collection of carved bench ends from the fifteen and sixteenth century. As it was just 12 o'clock and for once the rain began to fall on a walking day we decided to take cover at Angie's Kiosk and sample the excellent pasties and bacon and sausage buns and teas. After a good rest and food some walked back to Lostwithiel and some continued on the circular route back to Lerryn via St Winnow Mill in drizzle and with plenty of wet legs and feet. Despite the various route options and the large number we all managed -well I hope we did- to get back to our destinations after an excellent 5 mile walk. WILL YOU LET US KNOW BY SUNDAY 11TH JULY LATEST PLEASE IF YOU WOULD LIKE TO COME ON WALK AND IF YOU CAN OFFER LIFT. 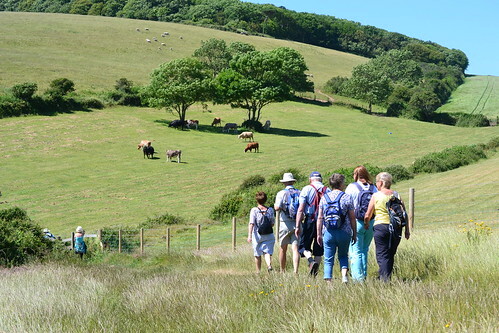 On a day which was forecast to be very hot ten walkers set off from the Community Centre to make the short journey to the 50p car park at Menabilly Farm. Although hot even at 11.00am the cooling sea breeze made it excellent for walking as we headed down the track past the milk churn cash box towards Polridmouth Cove. Polridmouth Cove was used by Daphne du Maurier as the setting for the death of the eponymous heroine of Rebecca. Today Polridmouth retains much of its picturesque character. The lake at Polridmouth was made use of in the Second World War as a night time decoy in the bid to protect the strategically important Fowey Harbour. Turning south westward from the cove we climb towards the striking Gribbin Daymark which was in the process of being painted with the highly visible red and white stripes. 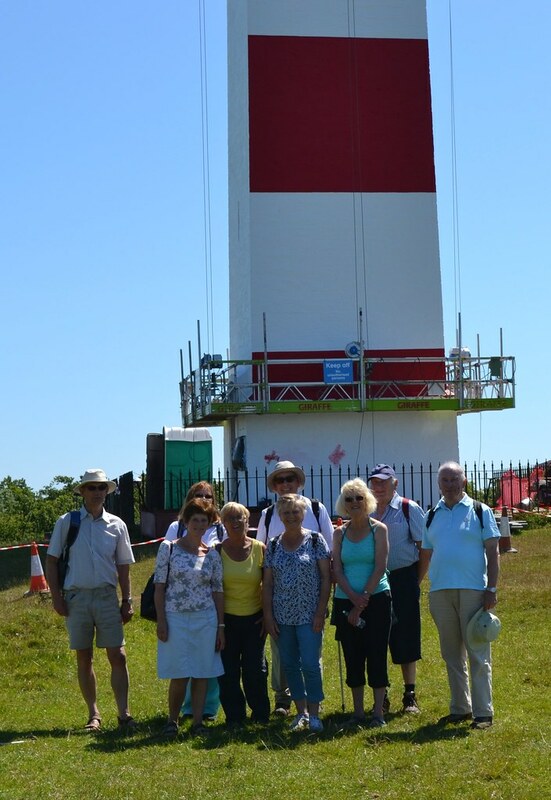 This 84 feet (26m) high square beacon tower was erected by Trinity House in 1832 to distinguish the Gribben from Dodman Point and St Anthony's Head and thus make navigation into Fowey and the harbours of St Austell Bay safer. It was never lighted but painted as a daymark. It has been a Grade 11 Listed Building since 1974. 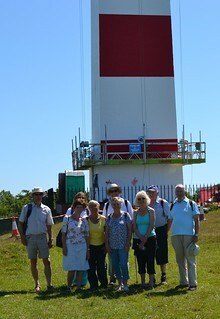 Time for our usual photographs with the daymark as the back drop (Click here to view enlarged image) before we proceed around the headland on a flat and very dry part of the coast path with the bright blue sea glimmering below. Heading down towards the sea we can hear the sound of children playing on the beach at Polkerris as we reach our lunch stop. 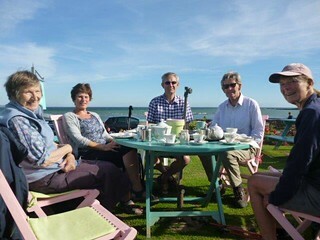 Some used the cafe to compliment their picnic, others went to the Rashleigh Inn for a very welcome stop. Some even arranged to meet their wives at the pub and had their meals ready for them on their arrival. Some of our group even went on the beach for a paddle and it was remarked that it was like an episode of Bay Watch with our own versions of Pamela Anderson! The beach has been in the news recently as it went on the market recently complete with a water sports centre for the sum of £250,000. With no takers in our group we went up the path out of the village, with a quick detour to look in the art studio, towards the road. Yellow reflective jackets now on we take the right turn towards the car park after a good 3.2 mile walk which everyone enjoyed. 1. 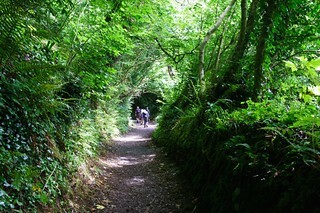 3.5 MILE CIRCULAR ROUTE TAKING IN CLIFF PATH,TRACK AND MINOR ROADS. 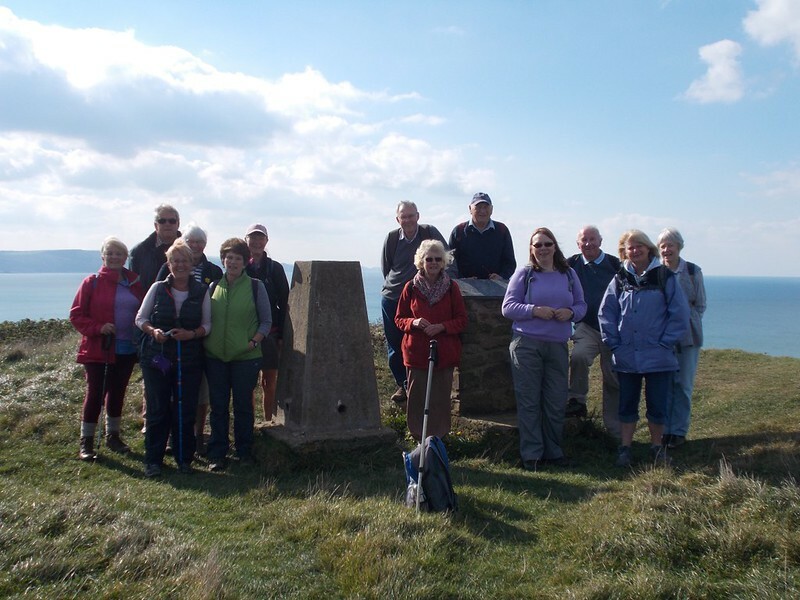 WILL YOU LET US KNOW BY SUNDAY 28th JUNE LATEST IF YOU WOULD LIKE TO COME ON WALK AND IF YOU CAN OFFER LIFT. 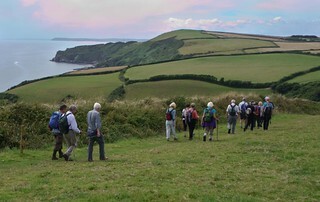 This 5 mile circular route used the South West Coast Path on the way out and the wooded tidal creek of Pont Pill on the inward leg- part of the Hall Walk. 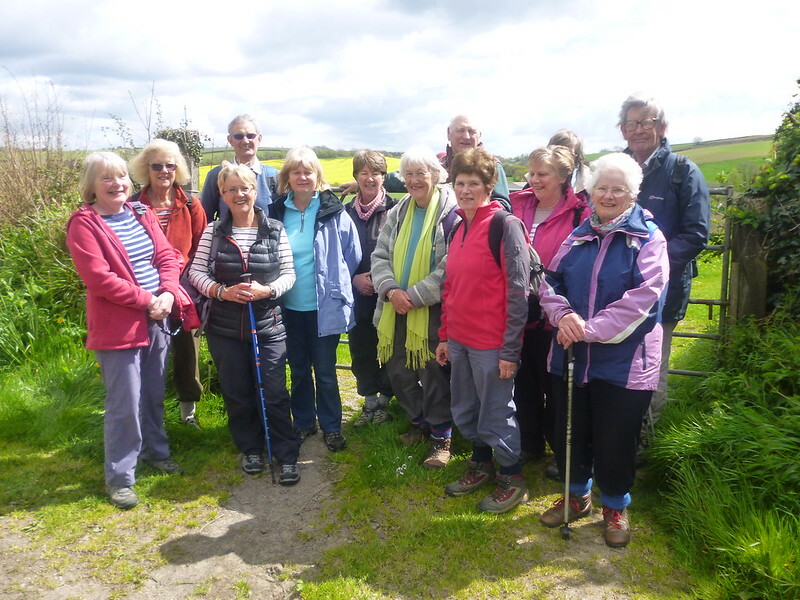 Without wishing to sound boring but again the weather was our friend as 11 walkers walked all or part of the walk on another glorious morning. 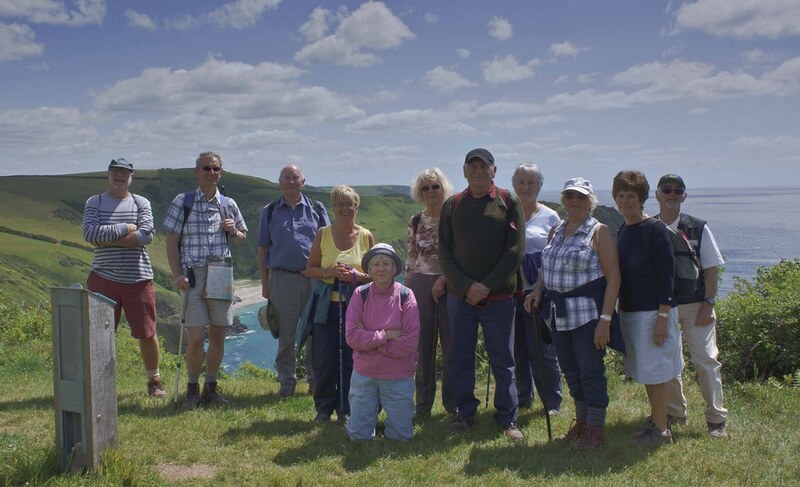 We set off from what is now called the Lantic Bay Car Park and immediately headed onto the coast path and that view over the calm blue sea with those glorious colours of the sea and the different shades of blue in the sunshine-who wants the Med or the Caribbean? Travelling west from the Great Lantic Beach we travelled both up and down on a firm surface with the occasional stop to look at the view as we headed for the village of Polruan. Polruan lies only a few hundred yards from the bustling town of Fowey across the estuary and a regular passenger ferry runs between the two. Headland is a coastal garden overlooking the English Channel and the Fowey Estuary. 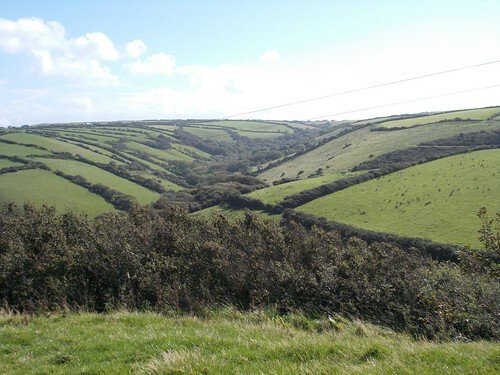 It's unique position on the South Cornwall coast has an almost sub tropical climate which allows such as palms, tree ferns and echium to flourish. It opens to the general public to raise money from charity on Thursdays during the summer months. Down to the harbour side and decisions of where to eat lunch-the crab sandwiches and the scones at the local cafe were certainly popular and great value. Time to start back, via the detour due to the landslide that seems to have been in place for months, as we head out of Polruan and on the Hall Walk route along the wooded estuary of Pont Pill towards the church of St Winwaloe or St Wyllow. (further details of the church can be read in my Report of Walk of the 10th March). After a brief visit to the church we headed up hill past Churchtown Farm to the car park and our return home after another great day out. 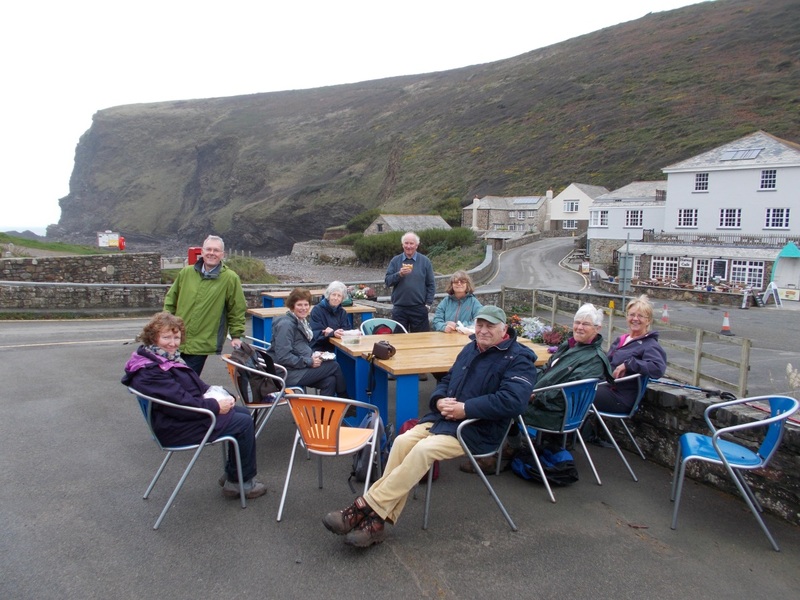 3) LUNCH STOP AT POLRUAN EITHER WITH PACKED LUNCH, PUB, PASTY OR TEA SHOP OR ALL FOUR OR ANY PERMUTATION! WILL YOU LET US KNOW BY SUNDAY 6TH JUNE LATEST IF YOU WOULD LIKE TO COME ON WALK AND IF YOU CAN OFFER LIFT. WHO WANT EVEN MORE EXCITEMENT WE WILL BE PLANNING TWO MORE STRENUOUS WALKS FOR THOSE WHO WANT DURING JULY AND AUGUST. 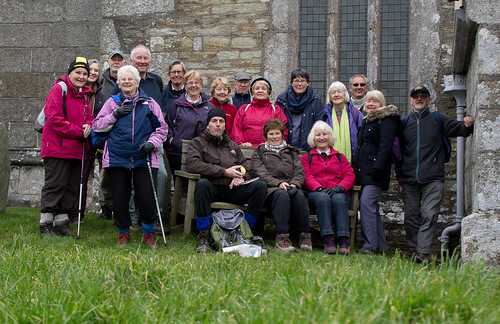 A great turnout of eighteen walkers set off from the church at St Breward to walk the 3.2 circular walk taking in valley and farmland and rising up again to the moorland surrounding St Breward some 700 feet above sea level. The church, dating from the Middle Ages, claims to be the highest in the county and its tall tower can be seen for many miles around. We start from just up from the church to turn left and head down the into the valley to a hamlet called Tuckingmill. Tucking was the Cornish term for fulling-the process for cleansing woollen cloth to eliminate oils and dirt and matting the fibres to make it thicker. There are several hamlets and villages in Cornwall named”Tuckingmill”. We head further into the valley and into Lamphill Woods with the bluebells still giving a wonderful natural spring look. The woods are home to numerous species of butterfly including the rare Pearl-bordered Fritillary. More animals can be found a bit further ahead as we go through Coombe Mill Farm a family friendly holiday farm with fallow deer, alpacas, donkeys, pigs and many more animals enjoying this peaceful setting. After crossing a small bridge we pass the stone buildings associated with the holiday farm and climb up (what comes down must go up!) to a left turning into a large field which then leads us down past some large trees to the stone bridge across the River Camel. The River Camel (which we have crossed many times during the last two months walks) runs for 30 miles from Bodmin Moor to Padstow Bay. 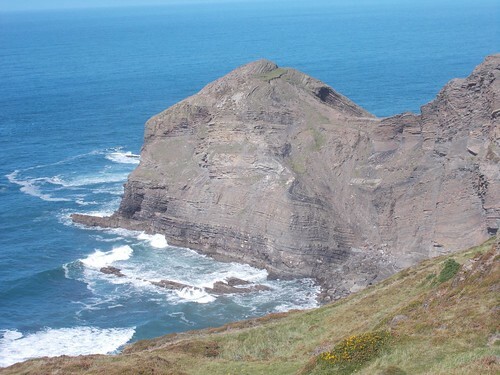 The name Cam-El is from the Cornish meaning “crooked one”. The river is classified as an SSSI and bullhead atlantic salmon and otters breed in the river. Up again through more fields takes us onto a lane where we allocated two reflective jackets to the best turned out walkers before heading towards the village of St Breward. The village of St Breward is on the northwest side of Bodmin moor and the parish covers Roughtor and Brown Willy. The name of the village is said by some to come from the 6th century Cornish Saint Branwalader others say it is from a 13th century bishop of Exeter. Turning left into Coombe Road we take a more scenic route up into the village by heading down again and then right before an old red iron shed to follow footpath signs. The sheds belong to the Tor Down Quarry which opened in 1840 to supply granite to rebuild Bodmin's notorious gaol. Granite quarrying in St Breward was the main industry for centuries and the granite produced was used far and wide :the Naval College at Dartmouth, London's County Hall, Tower Bridge and Blackfriars Bridge are all built from granite quarried in St Breward. Landmarks such as Eddystone Lighthouse, Winston Churchill's statue and the London Cenotaph are all hewn from granite mined in St Breward. It is uphill now for our last climb alongside a steam cascading down the rocks to our right until we meet the road again before passing down a path beside the Primary School, protected not with CCTV but with a cattle grid, through a farm yard until we see welcoming sign of the Old Inn and our pre-booked lunch stop. The inn dates back to the 11th Century when it provided shelter for monks and claims to be Cornwall's highest Inn. The pub was used as the setting for the TV comedy drama Doc Martin when the baby was born to the main characters. Nothing so dramatic happened to our group but we all had an excellent lunch sat outside in the sun with the view onto the moor as our backdrop. 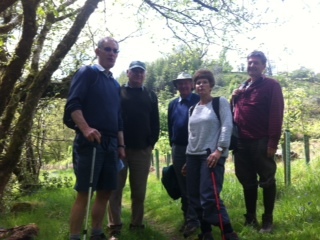 On another tremendous Tuesday morning only 6 of us set off on the lovely 5.5 mile circular walk around St Neot; a village which nestles in a sheltered valley on the southern edge of Bodmin Moor. 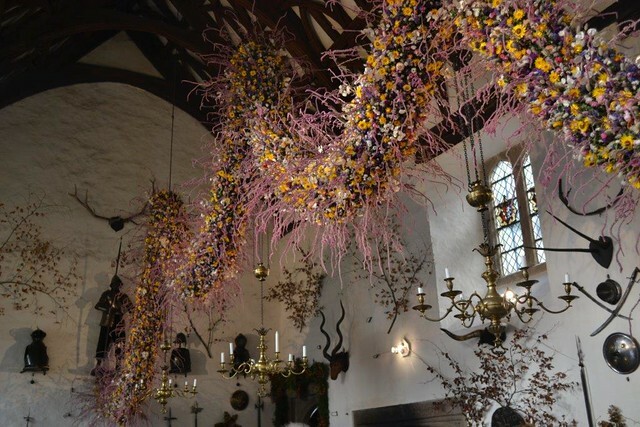 The village is famous for its Oak Apple Day celebrated on 29th May each year. The celebration was started in 1660 when King Charles 11 returned to the throne and created it as a public holiday which continued until 1859. After leaving the free car park and the excellent public conveniences we turned up the lane beside the pub The London Inn (which recently closed again after a short tenure by the tenants) a coaching inn on the route to the capital. Before the A38 was constructed in the 1830's the main road from Bodmin to Liskeard was via St Neot. The hill leading east is still locally known as “London Bound”. A steep climb first up steps and then through two fields enclosing some very nosey cattle and with excellent views of St Neot in the valley we finally headed onto a lane which wanders past Tremaddock Farm and after a further gradual climb and then across the moor. At the top of the hill is a prehistoric enclosure known as Berry Castle containing the circular remains of 9 huts. After a short period we reach a left turn opposite an old barn and then through a wood with its spectacular blue bell display. Some estimates suggest that the UK has up to half of the world's total bluebell population. The poor bluebell faces a number of threats from large scale removal, now a criminal offence in the wild and the extensive hybridisation with Spanish bluebells. After a brief period through farm land we again pass through another bluebell wood and at the bottom of the deep valley is a tributary of the River Fowey known as Trenant Stream. This stream ends in a confluence with the River Fowey just below Golitha Falls-the site of one of our well known short walks! During mediaeval times the rivers around St Neot were diverted to extract alluvial tin a method known as “tin streaming” which reached its peak in the 12th century. We had our lunch next to the River Fowey listening to the gentle flow of the water under dappled sunlight. 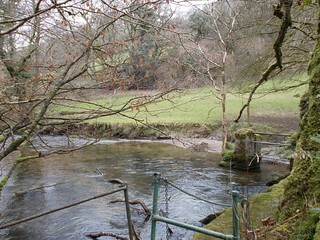 The River Fowey after rising close to Brown Willy is fed by 7 tributaries as it passes along its 25 mile course. After leaving the riverside we pass near to the old bridge at Treverbyn Mill built in 1412-13 and now replaced in normal use by a newer version. Back uphill again and through a field made difficult to walk in by cattle making imprints on wet ground we use some minor roads to pass an ancient cross which was moved in the 1930's from its original site downriver from the St Neot car park. Another half a mile takes us to Higher Newton and a track which takes us back to the lane leading from the pub and the church. The present church of St Anietus is a fine 15th century building of granite in the Perpendicular Gothic style. Another good walk showcasing some of the inland beauty of Cornwall. 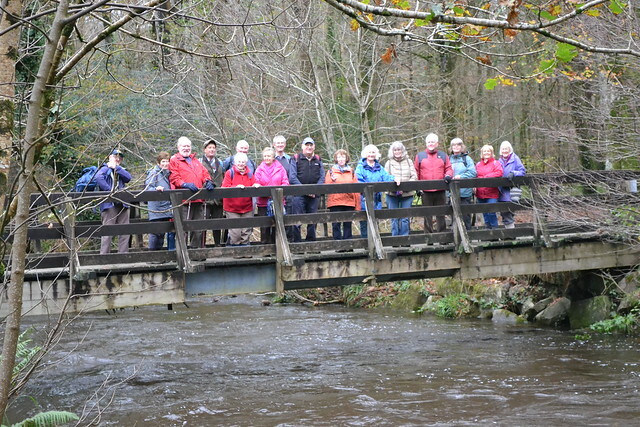 AT THE LOSTWITHIEL U3A WEBSITE AFTER THE WALK HAS BEEN CARRIED OUT. On a reasonable late April morning 14 walkers set off from the car park overlooking Whitsand Bay some 7 miles east of Looe and 5.5 miles west of Rame Head and infront of the imposing facade of Whitsand Bay Hotel. This hotel was originally the Thankes Manor House at Torpoint which was demolished, removed stone by stone and rebuilt on its present site in 1909. 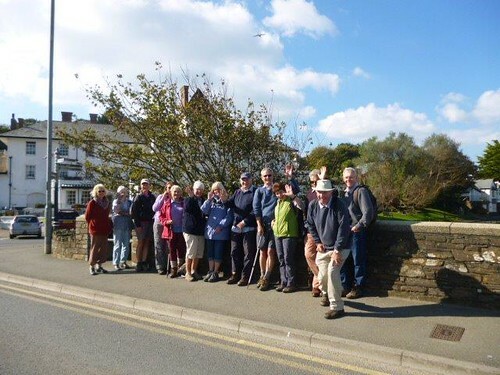 We started our walk from the car park and all showed an interest in the new Eco house being built on the seaward side of the road with spectacular views of the bay from its grass covered roof-if the picture on the site board is to be believed. Turning left by the Golf Club car park we head upwards towards Sanders Lane. The lane was once used to convey sea sand from the beach to be spread on inland fields to sweeten the naturally acid soils of the region-hence its name. The lane being sunken provides a home for many plants that would not otherwise survive in this wind-swept coastal environment. After crossing a road a second section of Sanders Lane ends in a quiet country road and the first part of this 3.3 mile figure of eight walk. 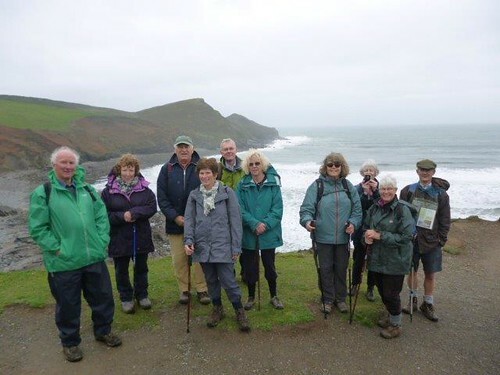 You can, although nobody did, take a short cut back to Portwrinkle to make a circular 1.5 mile walk. After a 200yd walk on the road we turned left over a stile and into a wide tree lined track with a small stream running alongside and a cultivated withy bed. Withies are the long flexible shoots of willow used for basket making and particularly in this area for crab and lobster pots. Conditions in this sheltered valley with its moist ground are ideal for the cultivation of withies. The path continues rising steeply up the side of the valley and another stile towards the farm buildings at Tregenna and access again to a quiet country road which meanders gently down hill with the spire of Sheviock Church reaching through the trees ahead. A short stop for our customary photo shoot gave us time to contemplate and admire the surrounding countryside. After a further 0.5 mile, having passed through the farm at Tredrossel, we join another quiet road over a granite bridge to the junction with Crafthole Road and a busy road. Time to get out our Bright Yellow Reflective Jackets-purchased with thanks from a grant from the Lostwithiel U3A . After crossing the busy road we were able to turn left down this lane which falls steeply towards the coast and is known as Donkey Lane, an indication that it was once used by pack horses and donkeys carrying sand from the beach and probably goods from Portwrinkle to the inland farms and settlements. Before turning left along the sea front we pass what was once the old harbour wall built in the early part of the 17th century. Portwrinkle was at that time an important centre for pilchard fishing which in turn helped to create a thriving community. In the Summer pilchards were cured packed between layers of salt in casks or hogs heads. The village would have had its own cooperage to manufacture the 20,000-40,000 casks required for the curing as well as the casks to contain the by products such as oil and the mixture of blood and brine, known locally as “drugs” and used as fertiliser. As pilchards moved west however in the 19th century this lead to the rapid decline of the village. A short walk along the sea front leads to the car park but not before we sample the delights of the local Cafe over looking the sea. UPS AND DOWNS. CAN BE MUDDY IN PLACES. bay, allowing us longer than 2 hours, the sun had come out and the promised 17C looked likely. Camelford qualifies as a moorland "capital" yet its immediate surroundings are entirely unmoorlike in character. and a granite clapper bridge-an ancient form of bridge found on many upland areas of the United Kingdom. We decided that this was an excellent spot for our first relaxed photo all trying hard not to pose! Crossing the bridge and another stile we headed higher towards the Advent Church of St Athwenna. 14th cetury by the Duke of Cornwall and is constructed in the perpendicular style. highest point before we go across more fields (and stiles) to reach a stoney track at Aldermoor Farm. stroll onto the A39 again. slices of home made cake or toated tea cakes. 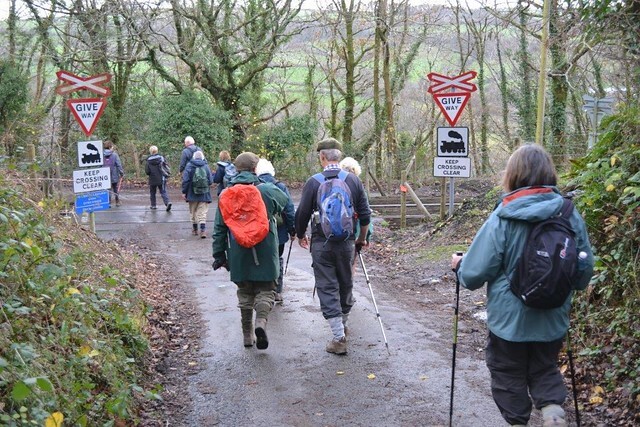 On a blustery but dry and partly sunny day 15 members set off from the Community Centre to walk the 3 or 4 mile circular route passing Restormel Castle and returning either down Restormel Road or Cott Road. 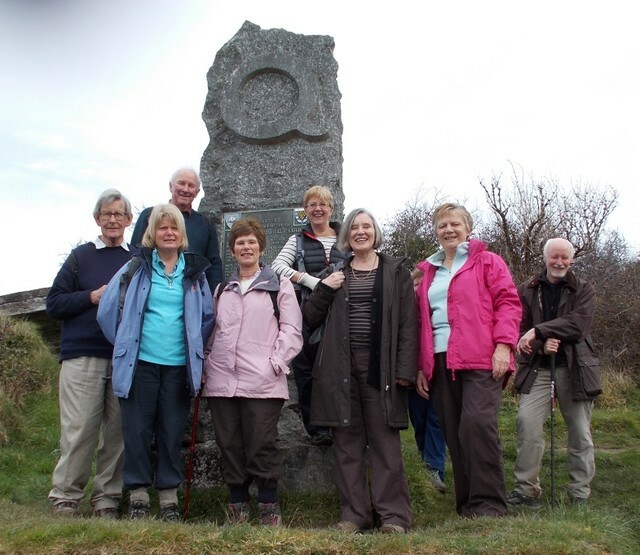 When we did this same walk in November 2013 we only had eight participants. 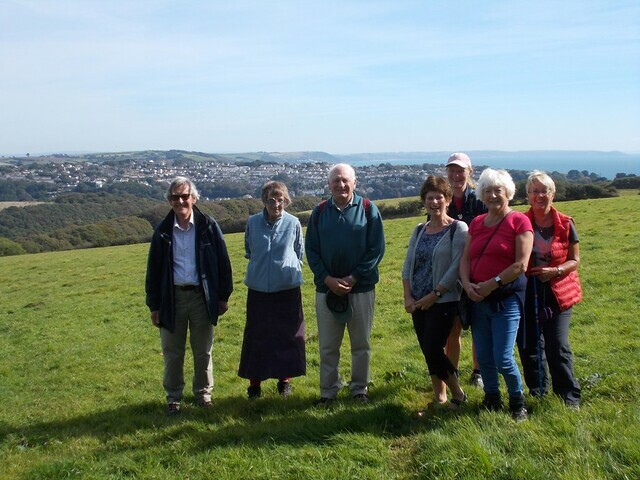 We started by walking up Tanhouse Road and then up the long well maintained footpath to Poldew and a magnificant view over Lostwithiel with the Fowey meandering towards the sea-an ideal place for a photograph. After a quick stop we proceeded towards Hillhead before crossing the B3268 and taking the footpath towards Barngate Farm and the new fencing and gates which takes you past the old mine shafts before turning right. spur beside the River Fowey. Twice visited by the Black Prince it finally saw action during the Civil War in 1644.
and rail bridges and up through the wood to the Duchy Nursery and a well earned drink sat outside in the wind. We then walked along Cott Road past what was the golf club and a new building site back to the start. AND IF YOU ARE PREPARED TO OFFER LIFT. How lucky we were again to have such wonderful weather for our first walk in Spring. Ten of us lucky people set off from the National Trust Car Park at Pencarrow-just south of Churchtown Farm rather than north which I stated in my initial note-and I was leading the walk! !.On this circular walk, with only a short section that was covered twice, we headed right off Saffron Lane to walk in farmland to Carne Hill and Carne Hill Cottages and then left past Ring o'Bells Cottage to Watergate in the Pont Valley. At the point where the road crosses the river is a point where the ancient Gragon Leat powered waterwheels for many centuries. The mill was used process locally spun cloth and continued until the 18th C. On the valley side here at Watergate was the site of a small vineyard. Turning left towards Pont and before we head up towards the junction with the Hall Walk can be seen Lombard Mill which dates back to 1298 where corn was ground;the water wheel can still be seen on the side of the building. At the top by an old slate cattle grid we choose to walk to Bodinnick along the famous Hall Walk. 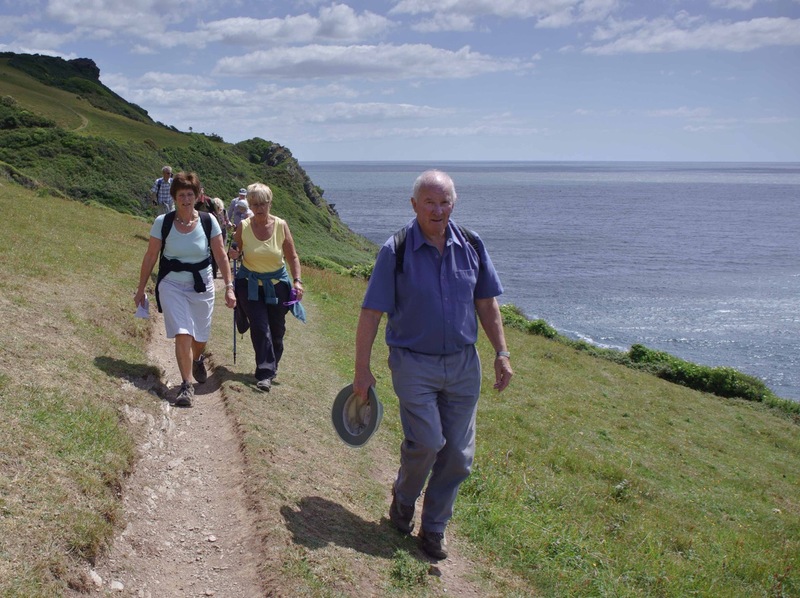 Over 40 acres of Hall Walk and the cliffs below were given to the National Trust in 1945 by Colonel Shakerley to commemorate the men of Lanteglos and Fowey who fell in the Second World War. 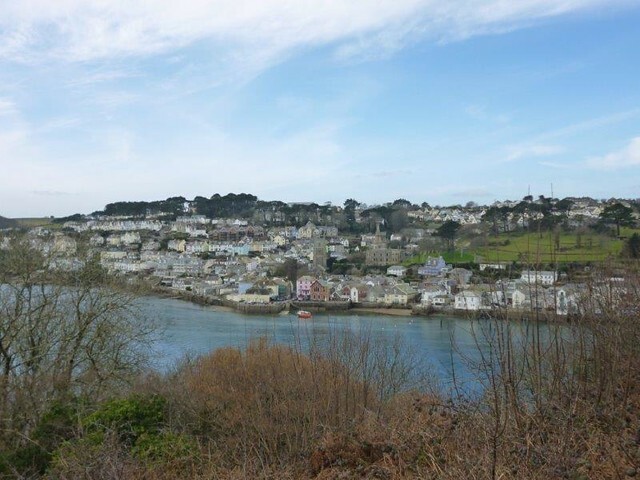 With excellent views of the inlet and out beyond Fowey and Polruan to the sea it is a spectacular vantage point and we soon come across the monument to Sir Arthur Quiller-Couch, known as Q, and a perfect place for a photograph. Quiller-Couch was a a writer who was a classic scholar at Oxford at the age of 19 and a journalist in London before returning to Cornwall and Fowey. He was knighted in 1910 and appointed as Professor of English Literature at Cambridge by King Edward VII. This was not the only literature lovers treat on this walk as the creek described in the 1930's "Love in the Sun" by Leo Walmsley is thought to be that below and on the other side of the creek on our route to Bodinnick and the house beyond the slipway called "Ferryside" was the one time home of Daphne du Maurier. Now with lunch time approaching we headed for "The Old Ferry Inn" and with the sun just coming out we had an excellent lunch sitting outside on the terrace taking in the rays-who needs the Tropics or the Canaries? It was soon time to start again as we headed upwards and this time past Hall Farm and the remains of a private domestic chapel licensed in 1374. The Hall estate was once in the ownership of Reginald Mohun of Dunster: a name we have come across on recent walks to Cliff and Boconnoc-see recent documented reports. After further uphill sections and spectacular panoramic views we retrace our steps past the granite cattle grid to the quay at Pont. This peaceful hamlet, now largely owned by the National Trust was a busy trading place and on the north bank is an old limekiln, boathouse and cottages and on the south a second lime kiln and a large notice board detailing shipping dues for such as manures,tin and coal from 1894. Heading upwards again to the steep path leading to St Wyllow parish church. This church was built in the 14th century and refashioned in the 15th. The 16th century benchends and panels from family pews have been preserved and the church contains the brasses of Thomas de Mohun and John Mohun and his wife from 1508. 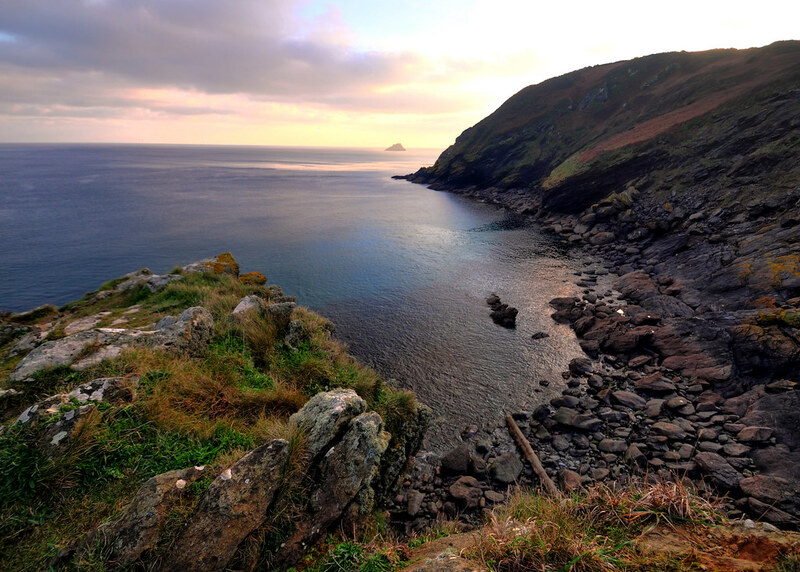 According to legend St Wyllow- an Irish hermit who had a chapel at the head of the creek-was murdered by a kinsman. He walked up the hill to the site of the church with his severed head under his arm, and the blood stained all the hedgerow flowers scarlet. The church of St Wyllow is best known as the church where Daphne du Maurier was married. After a brief visit we then turned left out of the church and up Saffron Lane to the car park-an excellent four hours had passed and the sun was still out and we had walked the 5+ miles of this excellent circular route and enjoyed the countryside and the facilities and snacks provided by the Old Ferry Inn. 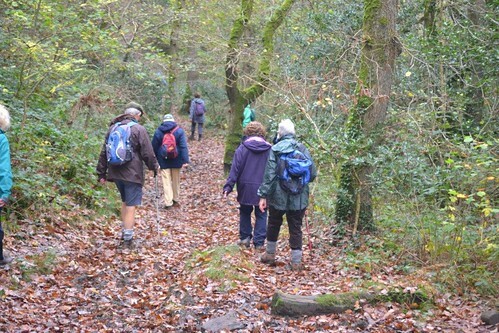 circular walk along the river to Cliff and then back on the road to Lerryn. and the walk follows the southern arm along the path which rises to the left into the woods. wharves and boat house, once used by Ethy House in St Winnow's parish. inspired to write "The Wind in the Willows". shelter small craft belonging to allied forces and also boats captured from the enemy. went to Cliffe, a parish on this side of the river that runs to Listithiel, where Colonel Lloyd, the Quartermaster Generall's regiment lyes to keepe the passe. The enemye keepes the passe on the other side of the parish of Glant. From thence his Majestie went to Lanteglos to the manor howse belonging to the Lord Mohun just over against Foye"
north to Lerryn with fantastic views across the Fowey valley to the distant moors of St Austell. shop before we all headed back to Lostwithiel and more things to do. 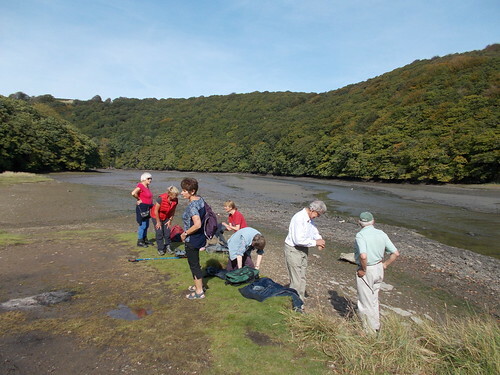 PLEASE LET US KNOW BY SATURDAY 21ST IF YOU ARE COMING ON WALK AND IF ABLE TO OFFER LIFT FOR SHORT TRIP TO LERRYN. WE WILL MEET AS NORMAL AT COMMUNITY CENTRE AT 10.15AM FOR 10.30 START TO LERRYN. Eighteen walkers set off from the car park at Cardinham Woods to walk through some of the 650 acres that make up the combined Devlock, Hurtstocks, Callywith and Tawnamoor Woods of Cardinham that have been in the hands of the Forestry Commission since 1922. Some of the old woodland of oak, beech,hazel,birch and holly still survives along side the commercial timber which includes larch, Sitka Spruce and Douglas fir. The woods are now a popular recreational area for walkers and cyclists with many marked trails designed for most abilities. After the few days of intense sunshine today was overcast but ideal for walking and we set off at a brisk pace past Woods Cafe to prevent anyone straying in before any exercise was had. After a flat stretch though Callywith wood we turned left at Lady Vale Bridge-we first turned left too early-to follow the stream through Devlock wood and then Lidcutt wood to emerge into a field and then onto a concrete track to the public road that leads us into Cardinham village and the church of St Meubred. St Meubred church was dedicated in 1085 to St Meubred the Martyr a fifth to six century Irish missionary who was beheaded in Rome and his body returned for burial in the church. depending which book you read during World War 2. The church and parish maintain their own identity with regular services, but currently share a vicar with Warleggan and St Neots parishes. and Milltown Farm before returning to the forestry track through Hurtstocks wood past Old Clapper Bridge and the site of Lady Vale Chapel to the car park. author, the cheese scones come highly recommended. Maybe he will have a chance to sample another day! The weather was fine and relatively warm for an easy stroll to Milltown, beginning with a bit of a hike up Rose Hill to the cemetery. 16 lively members took part. 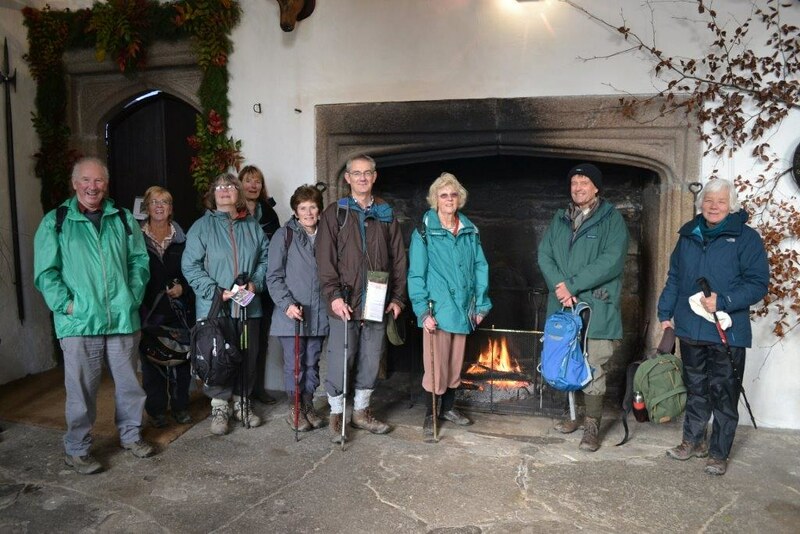 In leader Chris' absence, it was a joint effort with the walk lead by Jean and anecdotes added by various other walkers. The walk took us past Castle House, named perhaps as a reference to the site of an early medieval castle or fortification associated with the Tristan and Ysolde legend. Through Milltown/Lantyan Wood (meaning cold valley) of oak, beech, ash and holly, on a path known as Tristan's Path. And on to a viaduct where you would see a stone quarry probably used for the building of the viaduct. The first granite columns of the viaduct are the remains of Brunel's original viaduct' known now as Brunel stumps, built in c.1858 which supported the track on wooden trestles. Reuben was delighted to point out the finer details of the decorative stonework on Brunel's column compared with the later edition. We saw a point of the river along the way where ships of the 18th and 19th centuries may have berthed and transferred their cargoes to shallow barges to continue their journey upriver to Lostwithiel. Difficult to believe today. Continuing through Pill Farm and on to Coulson Park where Rob explained the meaning of the signs on the railway bridges, explaining how main miles and chains was the distance to London's Paddington Station. All in all a fun and informative walk. NEXT LONG WALK WILL BE ON 10TH FEBRUARY-DETAILS TO FOLLOW IN EARLY FEB.
On the car journey to Wadebridge we had hail, rain, wind and sun but despite the conditions on route it was OK as we all gathered on Guineaport Road to start the 6 mile walk to take in an area to the south east of Wadebridge. Ten walkers set off up the track towards Treraven the path being slightly muddier than when we had done the original investigation of the route but the sun was out and the walking conditions fine. However the higher we went the muddier it got-something between a first world war trench, a bog snorklers training ground and a tributary of the River Camel which we could see below us. on a minor road through the small village of Burlawn and down hill to Hustyn Mill and the fast flowing stream. We had planned to turn left after the bridge to go through Bishops Wood but work undertaken by the Forestry Commission had closed the track and meant a detour. 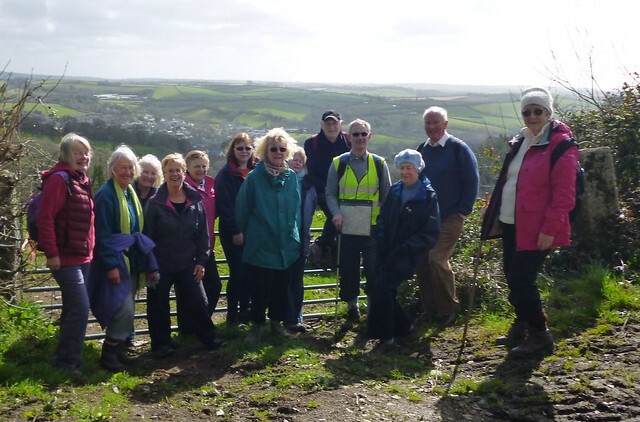 We met two ladies from Launceston U3A who were looking at possible walk for their group and after both consulting the map agreed a plan to try and avoid the wood and still get us back to the Camel Trail. The only way, apart from going back through the mud was to climb a hill that was like Bodmin Hill and Castle Hill together before descending to Polbrock Bridge and our planned lunch break and those picnic tables. 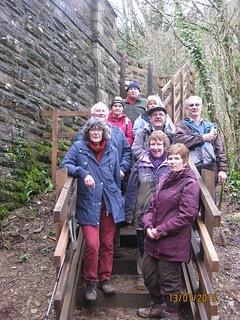 However we were prevented from using those because of the forestry work so we had to put up with the steps leading down onto the Camel Trail. Just a short mile and a bit walk along the trail to get back to the cars, a walk in the wet as it started to rain just as we left after our lunch break. Bearing in mind the weather prior to the walk and the forecast for the walk we got away with a reasonable day and despite the mud and the detour a good walk with good company; I'm sure we all felt better.